The 2016 MTH Sciences Seminar will be held at Business Administration Building (Room 102) on April 29, 2016. 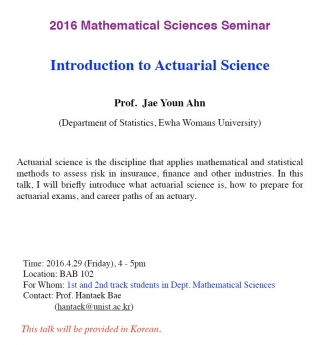 The lecture, entitled “Introduction to Actuarial Science” will be presented by Prof. Jae Youn Ahn of Ewha Womans University from 16:00 to 17:00 p.m. This lecture will be provided only in Korean.